The Environmental Protection Department in Hong Kong has set up a number of air quality monitoring stations. Since the end of 2013, a new indicator, Air Quality Health Index (AQHI), has been launched for reporting local air quality. The map shows the distribution of 12 general monitoring stations and 3 roadside monitoring stations in Hong Kong, indicated by green dots and brown squares respectively. 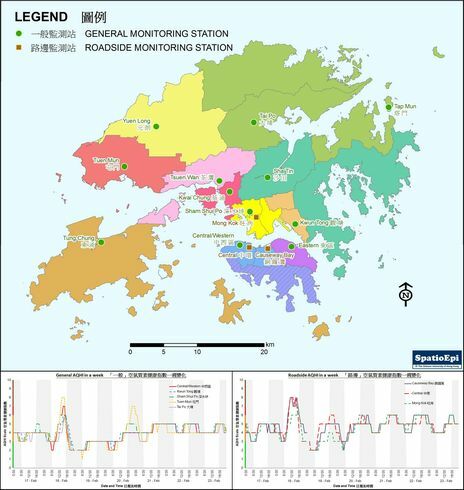 Except for the station in Tap Mun, AQHI from each general monitoring station represents the air quality of its own district as well as other district(s) shaded in the same colours. Air quality of Southern District is represented by AQHI from either station in Central/Western or Eastern District. The line graphs below the map show the variation of AQHI in the third week of February, 2014. Regular fluctuation of AQHIs among roadside stations is observed, probably due to daily change in traffic flow. Rapid rise in AQHI was detected in general stations on 18 February when a cold front arrived with prevailing northwest wind. 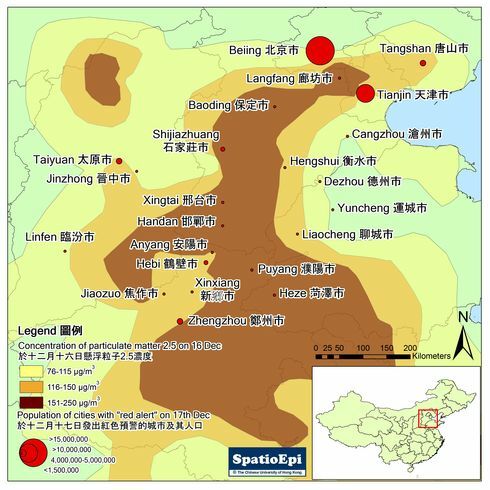 The observation that AQHIs from the stations located in the western part of Hong Kong increased first might be explained by the regional air pollution in Pearl River Delta. 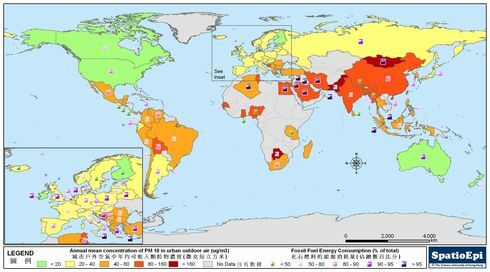 Data for the map were obtained from Environmental Protection Department, Hong Kong Government. The Air Quality Health Index (AQHI) is an indicator launched by the Environmental Protection Department of the Hong Kong Government, replacing the Air Pollution Index, since 30 December 2013. 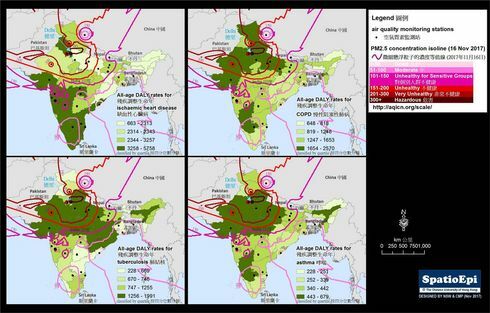 AQHIs are calculated based on the cumulative health risk attributable to 4 air pollutants, namely ozone, nitrogen dioxide, sulphur dioxide and particulate matter. This index informs the public about short-term health risk of air pollution and recommends precautionary measures for health protection. AQHI is reported hourly in 11 levels (1 to 10 and 10+) and grouped into 5 health risk categories (Low, Moderate, High, Very High and Serious). For each health risk category, health advices have been designed for people with different degree of susceptibility to air pollution, including (a) people with existing heart or respiratory illnesses, (b) children and the elderly, (c) outdoor workers, and (d) the general public.